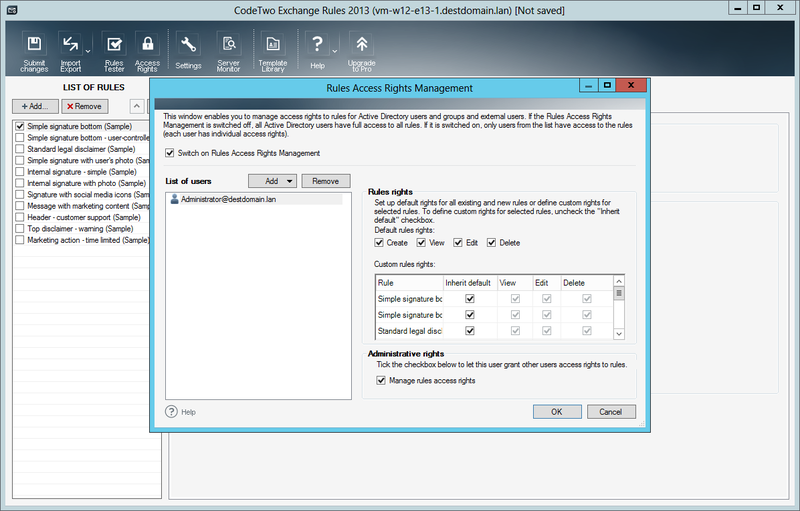 What's new in the latest versions of CodeTwo Exchange Rules Family software? 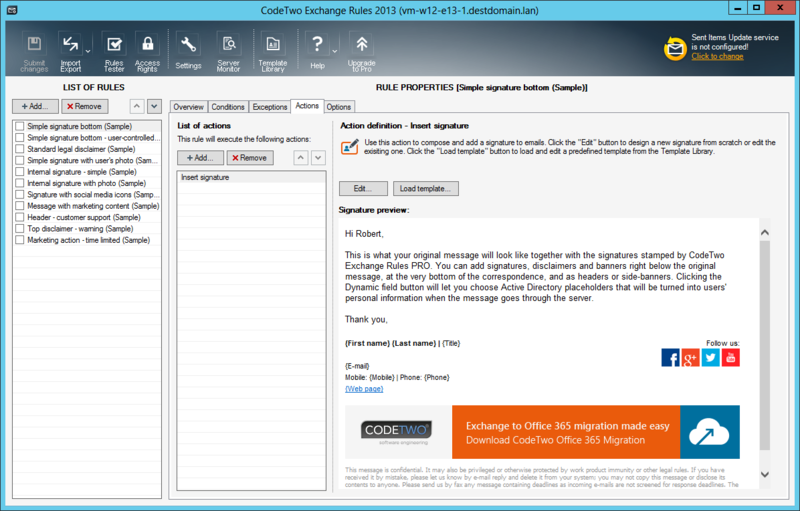 What’s new in the latest versions of CodeTwo Exchange Rules Family software? We have just released new versions of programs from the CodeTwo Exchange Rules Family line. Our dev team included a ton of upgrades and total overhauls within the software. Check the following article to learn more and prepare to be excited! We have improved CodeTwo Exchange Rules to bring its functionality to the next level, from the user interface right down to the engine operation. A service installed on all mail processing servers in an organization. It automatically propagates settings between servers, manages the work of Transport Agents, ensures correct application of rules and deals with message queues. A module, which is the configuration point for all your signatures. Install it on any machine, even outside of your domain. Grant proper access rights and delegate users that can design and manage signature rules. The Administration Panel communicates with all Exchange Rules Services in a domain. Create your signature rules and define conditions of their application using logical clauses. This new feature gives almost limitless possibilities to address any scenario with clear sentences describing conditions and exceptions. Graphical email layout tool. See the whole picture – design how your signature is positioned and how it looks in the email conversation. New HTML source code view, with AD fields and message property support. Create custom social links, modify banner hyperlinks and tune up your signature with ease. Now it is possible to check program’s service health and supervise its operation. Server Monitor also allows to check various mail flow indicators – number of processed emails, average processing time etc. All that information is also stored in convenient log files. Now the Administrator can delegate signature editing and rules management to marketing team (or any other user). Fine-tune access rights for specific user and let him help in the process. Completely overhauled, new interface is now easier to use, more responsive and clearer to look at. Setting up rules is now faster, more effective and simply convenient. Important change for companies where users have multiple email aliases. Now they can create different rules for each alias they use. Now it is possible to select specific users or groups that will see the signature in the Sent Items folder. Easily add non-standard AD fields with our new editor. Adding “givenName” or “coutryCode” dynamic fields to the signature is not a problem anymore. Yes, CodeTwo Exchange Rules Pro will work in a hybrid deployment, however messages needs to be routed via local Exchange to be processed by the program. Our company is thinking of migrating to a hybrid Exchange 2013 / Office 365. 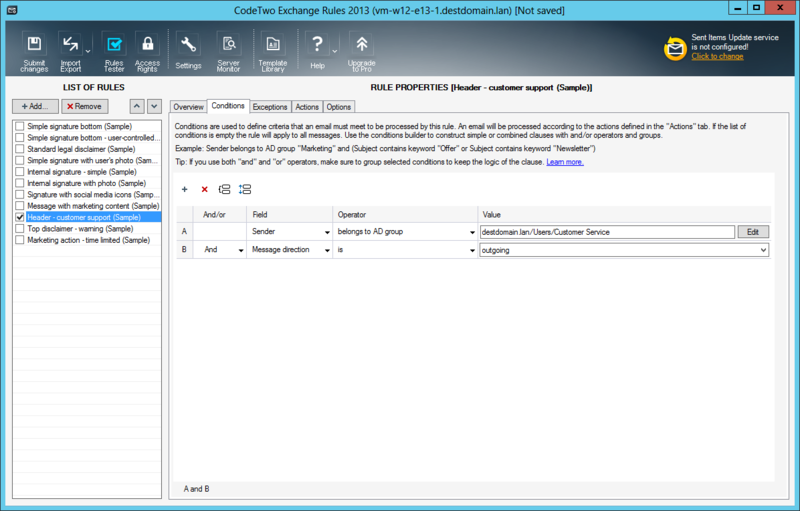 We already run CodeTwo Exchange Rules Pro on our on-premise CAS. Will your product work in a hybrid installation when we move some of our users to Office 365? If so, can you cite a link to documentation that will guide me in its implementation? Thank you. I’m trialing this product currently for Global signatures. We’re in a hybrid Office365/Exch.2013 premise. config. However, all e-mails are flowing through on-premise transport servers. 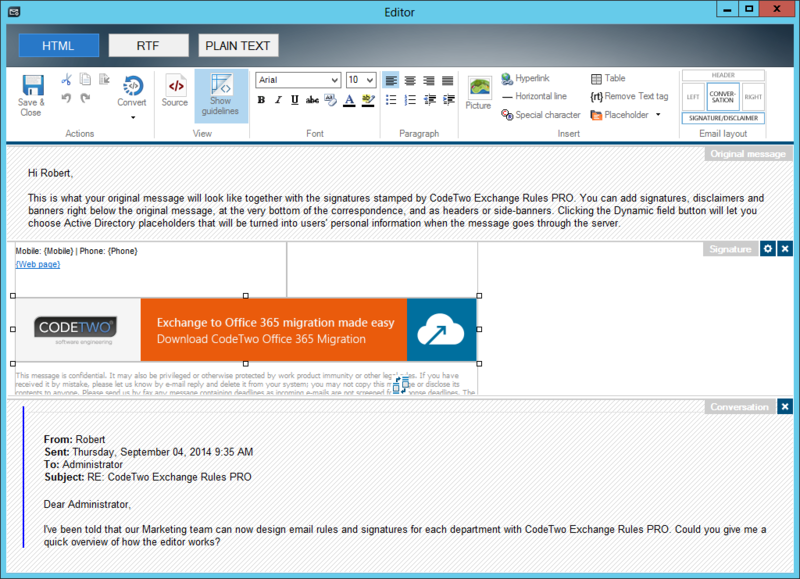 The current version seems to work well for on-premise clients using Outlook. However, for the cloud based users, it seems to be hit or miss. – Roughly 60% of e-mails are not tagged with the signatures. These e-mails don’t even show up in the entries in C:\Windows\ServiceProfiles\NetworkService\AppData\Roaming\CodeTwo\CodeTwo Exchange Rules 2013\AgentLogs on any of the Transport hubs. I’ve traced the messages on the exchange side and there’s no difference between the messages with the signatures and the ones without from exchange’s perspective. i.e. the e-mails all originate on the Outlook.com servers and are then sent to our on premise transport servers. Also, will the new version include the ability to update the Sent Items for Office 365 mailboxes? The program does support such environments. I believe the issue can be resolved with proper configuration and setup – please reach our support team: http://www.codetwo.com/support/form/ they will gladly help.